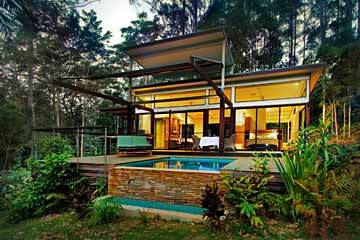 Holiday Resorts: Byron Bay - Gold Coast hinterland accommodation, NSW, QLD, Australia. Holiday accommodation in the Northern Rivers region, plus Kingscliff, Tamborine Mountain, Tweed Coast. Holiday resorts in the Ballina, Byron Bay, Gold Coast Region of New South Wales and Queensland, Australia. Holiday Resorts in our region will include on-site facilities such as tennis court, BBQ, sundeck, swimming pool, games room, gym and for rural properties, activities like bushwalking, horse riding, canoeing, golf etc.. There maybe an on-site bistro or restaurant, or meals can be arranged, but most will offer self catering facilities. Tariff is indicative only (per night/off peak). Bordered on three sides by World Heritage National Park, and set on 100 hectares (250 acres) at the end of a peaceful valley, just 13 private architect-designed luxury bungalows, are placed discreetly in a spectacularly pristine Australian rainforest. Bushwalking, birdwatching, massage and relaxation are the primary attractions at this couples only national and international award winning rainforest retreat. From AUD $375 p.n. to $655 p.n. midweek, 2 night min. Nestled on 50 acres of absolute beachfront, Elements Of Byron Resort & Spa features private beach villas sleeping 2-5 people. Guest facilities include 24-hour front desk, concierge service, room service, a day spa, beach club, lagoon swimming pool, rainforest eco trail, outdoor fitness circuit, fitness centre, and tennis court, along with optional horse back riding. There are 2 restaurants, a bar and cafe. Set in the World Heritage-listed Lamington National Park, O'Reilly's offers 1 and 2 bedroom suites and villas with a balcony overlooking the rainforest and mountains. A complimentary guided bird walk is offered daily. Facilities include spa and wellness centre with sauna, an outdoor infinity pool, hot tub, library with a fireplace, a games room with billiards and table tennis, and a restaurant and bar. A beachside resort featuring tennis courts, a tropical swimming pool and a large lagoon pool. All air-conditioned rooms include a private balcony and all suites include a fully equipped kitchen and laundry. The Spa At Salt features a steam room, spa bath and a range of massage, facial and body treatments for men and women. Season Restaurant serves breakfast, dinner and cocktails, and there are a number of restaurants within 3 minutes walk. 4-star hotel offering double and twin rooms, and suites for 2-4 people. Facilities include a restaurant, lounge/bar, full-service spa, an outdoor pool and children's pool. Other recreational amenities include a 24-hour fitness centre, outdoor tennis court, bowling alley, gift shop, and an 18-hole golf course. Golf Stay and Play packages available. Family-friendly hotel with an outdoor swimming pool, spa tubs, tennis courts, fitness centre with steam room, and outdoor barbecue areas, just 10 minutes stroll to Coolangatta Beach. Stylish hotel rooms and apartments have private balconies with twin towns, beach, river or hinterland views, and apartments with full kitchen facilities are available. Numerous dining options are available within a short walk.